GloveOn gloves protect your hands from hazards while providing exceptional consistency and comfort. Made by one of the most meticulous manufacturers, these gloves give you the peace of mind to conduct your best work. 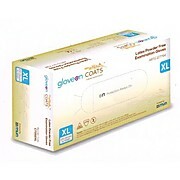 GloveOn continuously exceeds industry standards. In fact, they have been voted as the best latex and nitrile glove for overall quality by a third-party testing organization. For consistent quality, reliable protection and overall value, you can’t beat GloveOn gloves.